Today marks the first day of spring aka the Vernal Equinox. It is a good day to go kite flying. Next season the Arkansas Rep will be presenting Mary Poppins with its song about flying a kite. The original Broadway Mary Poppins, Ashley Brown, will be performing with the Arkansas Symphony as well next season. But this year, on the Arkansas Arts Center website, you can see art from their collection which features kites. The first is Alice Andrews’ Kite Flying. 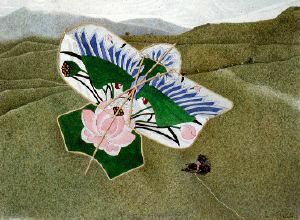 This 1978 watercolor on paper depicts a kite being flown in a field. The perspective is from above the kite looking down on it and the ground below. The artwork measures 21.5 by 29.5 inches. It was a gift to the Arkansas Arts Center in 1978 by the Mid-Southern Watercolorists. Alice Andrews lives in an old white farmhouse built in the 1800’s in the Boxley Valley in Newton County, Arkansas. Boxley is full of clear rocky creeks and pastures and is surrounded by mountains. It has the feeling of being back in time about one hundred years, and has more cow residents than people. Alice works in both oils and pastels. Her subject matter ranges from landscapes and paintings of her home and garden, to paintings of dreams, of allegory and of pure abstraction. Alice has been awarded residency at The Helene Wurlitzer Foundation in Taos, New Mexico, and the respected pastel artist Wolf Kahn personally awarded her a residency at the prestigious Vermont Studio Center in Johnson, Vermont. She is a graduate of Henderson State University and the Maryland Institute College of Art in Baltimore. 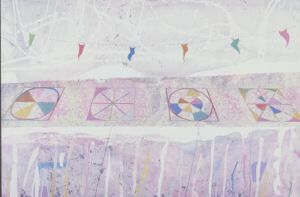 Another piece in the Arts Center collection is Lothar Krueger’s Day of the Great Kite Race. This 1980 drawing is chalk and colored pencil on paper. The art measures 21 7/8 by 34 inches. It was purchased by the Arkansas Arts Center Foundation after the 13th Annual Prints, Drawings and Crafts Exhibition. Lothar Krueger, was a native of Two Rivers, WI. Born in 1909, he became interested in art in Washington High School where he was “considered one of the greatest all-round football players in that school’s history.” He received his B.S. degree in art from Milwaukee State Teachers College in 1942 when he was drafted into the army. After officers training he took part in the World War II. In the war, he took part in the D-Day invasion of Normandy and received two Purple Hearts, a Silver Star and a Bronze Star. In 1947, he had one of his first art shows at the Wisconsin Historical Museum in Madison. Krueger joined the faculty of the University of Arkansas. During his tenure on the art faculty at the university, he established himself as a major artist in Arkansas and in the regional and national art scene by winning numerous awards and honors. He taught Art, Art Education, and Art Criticism from 1953 until 1981, and also served as acting chairman of the art department for a year. After his retirement from the university, he continued to live in Fayetteville. He died in January 2009 at the age of 89. 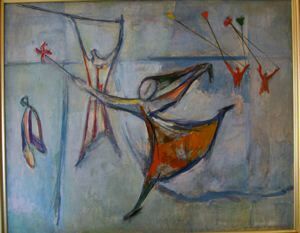 Manfred Schwartz’s Children Flying Kites is also in the Arkansas Arts Center collection. This 1960 oil on canvas measures 42 by 34 inches. It was a gift to the Arkansas Arts Center in 2005 from Janice M. Ireland. In Manfred Schwartz’s lifetime, he produced a significant and varied oeuvre, and was extolled by art critics and museums. Born in Poland in 1909, he emigrated to New York in 1920 at the age of 11, and was something of a child prodigy. Early in his career he showed side by side with Maurice Vlaminck, Bernard Buffet, Edward Hopper, and Andrew Wyeth. In 1929 he moved to Paris. There his art gained a new sense of freedom, which he expanded for the next forty years. Educated at the Sorbonne in Paris, the Academie de la Grande Chaumiere in Paris, the Art Students League in New York, and the National Academy of Design in New York. Studied with Charles Hawthorne in Provincetown, John Sloan, and Bridgemen. Manfred Schwartz created a sensational body of work; oils, pastels, lithographs, and we can see his evolution within three major periods that span fifty years of work. His earliest paintings were portraits and still-lifes. The colors were deep and muted, he preferred the umbers to the yellows. By 1940 he began to paint in a more abstract manner. His colors intensified and his images seemed ahead of their time. Schwartz died in New York in 1970. This entry was posted in Museum, Visual Art and tagged Alice Andrews, Andrew Wyeth, Arkansas Arts Center, Arkansas Repertory Theatre, Arkansas Symphony Orchestra, Ashley Brown, Children Flying Kites, Day of the Great Kite Race, Edwad Hopper, Henderson State University, Janice M. Ireland, Kite Flying, Lothar Krueger, Manfred Schwartz, Mary Poppins, Mid-Southern Watercolorists, Sorbonne, University of Arkansas by Scott. Bookmark the permalink.